Aata laddo is a rich Indian sweet recipe which is made from wheat flour, sugar, desi ghee, nuts and flavored with ilaichi powder. it is simple but taste Delicious, Aata laddoo is very healthy also. Aata laddo is a good snack for kids. गेहूं का आटा १/२ किलो . पीसी हुई चीनी 2 कप . देशी घी १/१/२ कप . अब इसमें इलाइची पाउडर और मेवा डालकर २ मिनट चलाते हुए गैस बंद कर दें. Heat 1 tsp ghee in a pan and roast the dry fruits. Remove from the pan then add ghee and flour and cook on low heat till the aata is fragrant. this take about ten to fifteen minutes. Now add cardamom powder, nuts and coconut stir 2 minutes and take it off the the heat. Let it cool for a while, Add sugar powder and mix well. 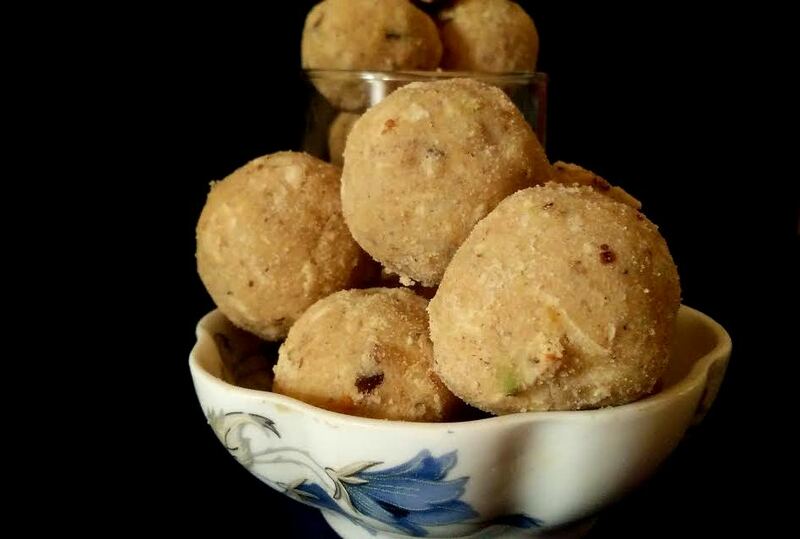 Shape the mixture into laddoo and store into airtight container when completely cool. you can add gond also, fry and crush the gond then add in laddo. आप चाहें तो इसमें खाने वाला गोंद को घी में तल कर इसमें मिला सकते हैं . अगर लड्डू ठीक से न बन रहे हो तो इसमें ऊपर से और घी मिला लें .